Fans of the beloved middle grade series “Ivy + Bean” may feel a flush of familiarity upon meeting the 15-year-old best-friend duo at the center of Barrows’s first YA novel. Charlotte is light-brown-haired and introspective, with literary ambitions; Frankie is a dark-haired impulsive go-getter. Think: Ivy and Bean, now with angst and four-letter words. The novel’s name comes from Charlotte’s assertion that “nothing” happens in their safe, dull lives. 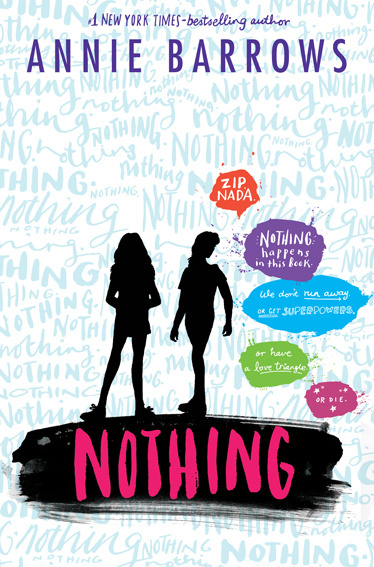 And so she decides to write a book called “Nothing,” tracing the course of her and Frankie’s year: “It’ll be, like, a searing document of today’s youth and how incredibly boring our lives are!” In chapters that bounce between third-person perspective and Charlotte’s confessional pages, the best friends gab, text, do homework, get high, buy burritos and mascara, humor their parents, and obsess over their love lives (or lack thereof). Frankie considers applying to private school and learns to drive. Charlotte develops an intense textual relationship with a boy she’s never met named Sid (she doesn’t know what he looks like because Sid has a “no-picture” rule). But just because the stakes are low doesn’t mean the book lacks depth. Barrows captures the highs and lows of her characters’ emotional lives with remarkable feeling, revealing how even the most joined-at-the-hip BFFs inevitably have secrets and resentments. Best of all is Charlotte’s voice, a hyperactive stream-of-consciousness gush. Spending time with these two is a lovely, low-key pleasure. Charlotte and Frankie are typical high school sophomores struggling to be interesting in a land of boring. Nothing ever happens to them, so when Charlotte decides to write a book chronicling their lives, she suspects it’s going to be pretty tedious. Shopping at the mall, hanging out with friends—this is the stuff of life as a 15-year-old but perhaps not the stuff of great literature. Except…in chronicling her life, Charlotte discovers that perhaps things aren’t as boring as they thought. After all, the two white teens get to host their own New Year’s Eve fancy dinner (even if it is attended by only the two of them), and they even embark on an epic road trip that might just lead to a longer adventure. The result is a charming novel about the daily ups and downs of school, love interests, friends, families, and social media. Barrows turns her keen observational eye toward teenagers, and the results are authentic and funny, filled with highly recognizable moments of teen angst and earned epiphanies. A moment in English class when some students of color question negative representation to their martinet of a teacher shines. Her characters—both teens and adults—are endowed with smart, realistic (and realistically foulmouthed) dialogue, and the problems they encounter both are believable and feel like glimpses into lives beyond the written page. Anyone who suspects their life is the most boring ever? Check out this book. Frankie and Charlotte, 15-year-old best friends, are average girls, in an average town, with average families. In a moment of reflection, contemplation, and conversation, the two decide to write a novel about how uneventful and unlike YA novels their lives are. They soon discover a world in which they are the center of every drama. This is a lighthearted, tongue-in-cheek novel about two girls navigating life, family dynamics, romance, and their friendship. Readers with find the irony funny and either empathize or become annoyed (sometimes both) with Charlotte’s angst-ridden thought processes. Recommended for fans of contemporary, realistic, and coming-of-age YA fiction.